Architects make blueprints, which are then used to build houses or office buildings. Coaches work up “blueprints” when they come up with creative game plans in the hopes of a victory. Military leaders work up a “blueprint” as they form a plan of attack prior to going into battle. Blueprints are designs. Architects, coaches, military leaders, and many others often form various kinds of blueprints prior to building a house, a team, or an army. Most everyone understands the value of blueprints, as well as the fact that blueprints call for a creator. Blueprints do not come together by time, chance, and non-intelligence. Furthermore, the more complex the designs, the more intelligent the designer(s) must be. Have you ever considered the design of the beaver? In a sense, a beaver’s body is the result of a magnificent blueprint. Its tail was made according to a blueprint. And it has a kind of blueprint engrained in its brain that enables it to build complex dams and dwellings. The beaver has one of the most recognized tails in the world. It is long and flat, which helps the beaver to balance when it stands on its hind legs. As a beaver swims, it uses its tail like a boat’s rudder, to steer exactly where it needs to go. When a beaver senses danger, it can make a loud noise by slapping its tail on the water, which alerts other beavers to get away and hide. Does it make good sense to think that a perfectly designed, balancing, boat-like rudder, which also functions as an alarm device, grew by chance on the end of the beaver’s body? To ask is to answer. Like a blueprint, the beaver’s useful, versatile tail shows design, forethought, intent, and purpose. 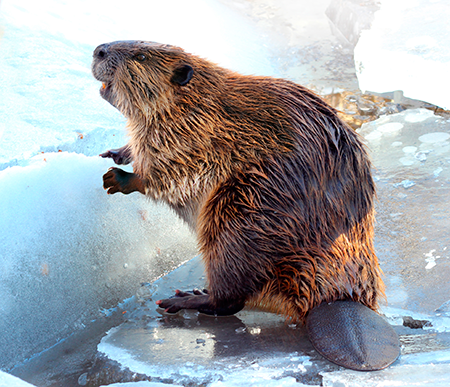 In addition to the beaver’s amazing tail, these cute critters are also well-known for their four incisors (front teeth). Beavers use their strong jaws and sturdy teeth to cut down small trees to build dams and homes. Their teeth continue to grow throughout their lives, but they never grow too long since the teeth are constantly wearing down as the beavers use them to cut and gnaw wood. Beavers not only have perfectly designed teeth; they also have perfectly designed mouths. The beaver’s front four teeth are separated from its back 16 teeth by a large space. (The front teeth are used for cutting and the back teeth for grinding.) In this space are flaps of skin that can close—separating the front teeth and back teeth. By closing up its mouth behind its incisors, the beaver can haul or gnaw on wood in the water without getting water in its mouth. The flaps of skin also help keep splinters out of the beaver’s mouth. 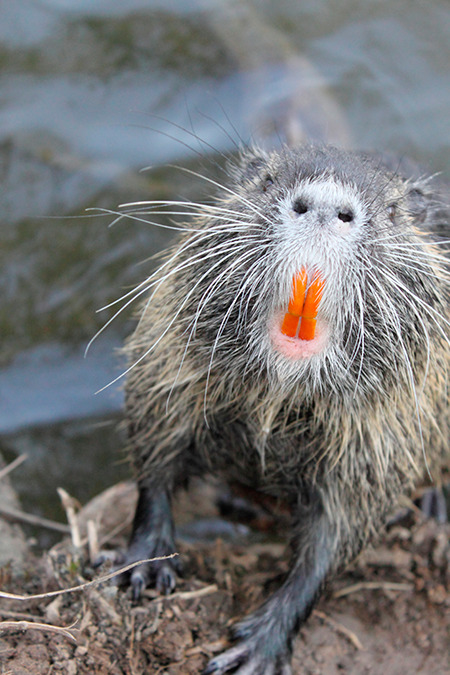 The beaver’s amazing teeth and mouth demand a Designer and defy the false theory of evolution. Not only is the beaver itself a kind of blueprint, it also has the ability to work from a blueprint. This blueprint is “built” into the brain of beavers. We call this instinct. A family of beavers will spend weeks or months purposefully placing branches, leaves, stones, and mud in specific places in order to build useful dams and lodges. Beavers are animal architects that demand an adequate explanation. They do not have to attend engineering school to know how to build a dam. They instinctively know how to raise water levels by building dams. How can anyone study the beaver and come to the conclusion that this animal is merely the result of mindless matter? Such functional, complex engineering demands a Chief Engineer. Indeed, beavers’ “blueprints” call for a Creator.